One would ask who are the Boko haram and who are the Fulani herdsmen? 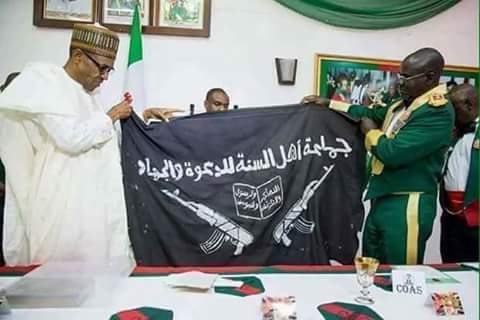 Personally, I do not think there is any different between the two because they are Islamic set of people terrorising the contraption called Nigeria, their goal and motivation are the same, they are serving the same people and distinguished masters; the Northern Nigeria and their cabals in politics business and other sectors of Nigeria such as military, police. For one to argue that Boko haram is different from Fulani herdsmen is a total ignorant of the happenings in Nigeria, even those who are not in the country knows it well that Boko haram and Fulani herdsmen are working for the north and the Islam. No one under the surface of this earth fight for no reason either just or unjust, they are fighting for a reason and that is to Islamize the entire Nigeria because it is their promise to Allah, terrorism is the tools they are using to accomplish it, they have influenced and caged the whole northern part of Nigeria with Boko haram insurgency and they channelled Fulani herdsmen to other parts of Nigeria and Biafra land to kill, oppress the people conquer them and enthrone Islam in order to achieve their goal of Islamizing the so called Nigeria. These two terrorist groups are being sponsored by the northern leaders and elders as well as other Islamic countries in the world, President Muhammad Buhari the incumbent Nigeria President said in one of his 2015 presidential campaign speech that an attack on boko haram is an attack on the entire north. Many Nigerians are beginning to ask questions about the sponsorship of these Islamic sets killing thousands of innocent citizens and the answer remain that they have strong backbone from the north because they are no reasonable business man that will spend millions to guard goods worth thousands. The Fulani herdsmen uses guns worth millions to terrorise people whereas a cow despite how big and mature it is will not be sold more than two hundred thousand naira, the same is with boko haram terrorist group that uses highly sophisticated weapons such that the Nigeria government forces cannot defeat; despite several news that terrorism has being defeated in Nigeria. One with rightful mindset would question are those street boys and little girls recruited into the group that afford the money to buy those weapons worth billions of dollars, if they do not have strong joint financial supporters? The truth remains that the northern leaders and elders know the sources of terrorism in Nigeria. As long as the contraption called Nigeria remains one country with the Hausa, Fulani, Yoruba, Biafra and other ethnicities peace will never reign because Fulani herdsmen and boko haram will not seize action not to talk of retreat or surrender till their Islamizing agenda and mission will be accomplished. There is no better thing to do now than to join hands together with the Indigenous People of Biafra (IPOB) under the leadership of Mazi Nnamdi Kanu on their effort and end Nigeria, because it has expired and it is now hazardous and dangerous to the occupants. The togetherness of Nigeria is only beneficial to the few out of millions of her total populations and they are Hausa Fulani people who claim the ownership of Nigeria. Indeed, there is no better time to end Nigeria than now, support Biafra referendum and let us unanimously end this contraption Nigeria.